My echinacea is in its glory now, a couple of weeks early, as are so many flowering plants and shrubs in the Berkshires this summer. This beautiful North American native — also known as purple cone flower — is a magnet for butterflies, bees, and dragonflies. It was first employed by the Great Plains Indian tribes as an herbal remedy and later adopted for medicinal use by the settlers. In the first half of the 20th Century it was actually listed in the U. S. National Formulary as a remedy for colds and flu. 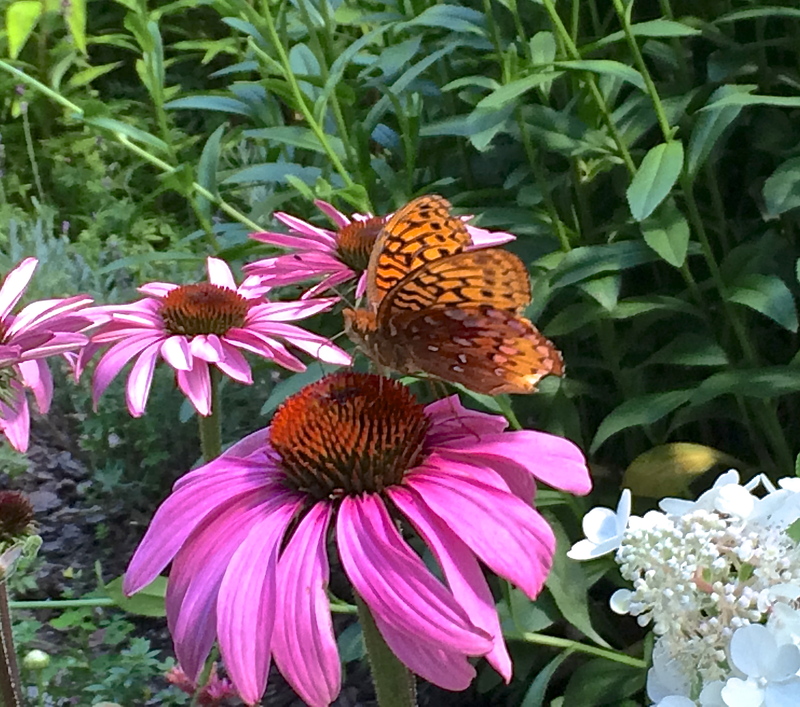 With the introduction of antibiotics, echinacea fell out favor with mainstream medicine, though it’s always remained a mainstay of alternative healing. Today, however, with the frightening rise of antimicrobial resistance to antibiotics, the scientific community is once again taking a look at the natural healing power of echinacea. An infection fighter —especially common cold and upper respiratory infections. One is advised to take echinacea at the first sign of a cold to keep it from developing and throughout winter and while traveling. As an aid to fighting the flu, take it as soon as symptoms arise and continue until symptoms disappear. 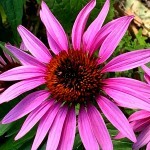 Echinacea can also help alleviate coughs and other chronic bronchial and respiratory disorders. A health booster. According to natural healing experts, echinacea strengthens the immune system by stimulating the production of T-cells and increases the ability of white blood cells to fend off pathogens. A compound found in echinacea apparently helps keep germs from penetrating healthy cells, so that viruses and bacteria don’t take hold in the body. An anti-inflammatory and wound healer. Echinacea is recommended as a natural way to heal skin problems, including boils, abscesses, wounds, ulcers, burns, eczema, psoriasis, bee stings, and sun damage. It may also help prevent cuts and scratches from becoming infected as well as speed the healing process. As with all supplements and natural healing products— which are not monitored by the government — it’s important to read the labels carefully. The good news is that though there’s no clear scientific consensus about echinacea’s overall benefits, its generally agreed that taking echinacea can’t actually harm you. As far as I’m concerned, though, nothing can be more healing and healthful than the sight of echinacea amid the vibrant colors of the August garden or in a vase of summer flowers. Nice, and just love that vase of flowers. I live, for now, in central eastern Maine…there is already a feel of late summer in the air. A lot of goldenrod and other signs. 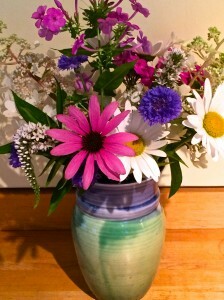 I love the dahlias, and asters. I wish they stuck around a bit longer, but there is always next year. 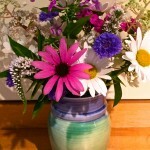 Lovely photograph of your beautiful flowers, and very informative news about the health benefits. Thank you! 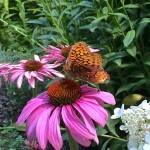 …awaiting my butterfly lady to give me the name of that one sitting atop that flower..unless you know the name! they are in the daisy family, right? would I see them in a city planting? do they come in other colors? do I ask too many questions? anyway, wonderful photos: worthy of enlargement and/or a watercolor!!!! I know what you mean about “next”. 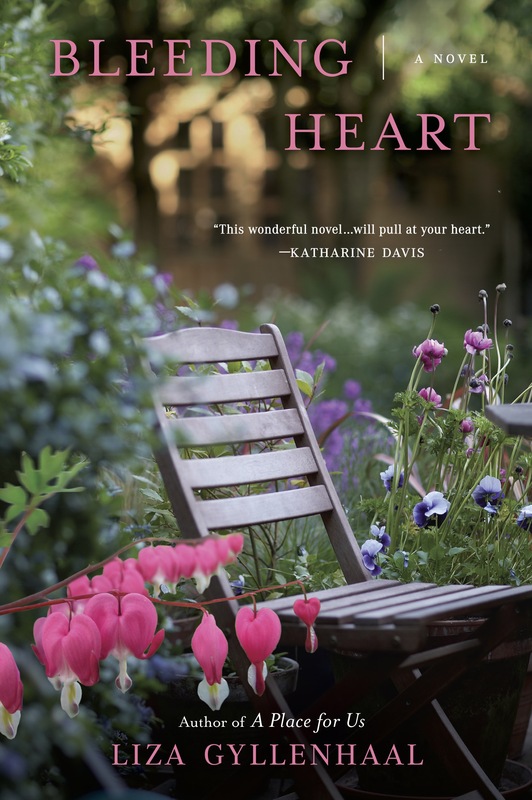 I love receiving these “garden musings”….the photos, poems, all of it. Feeds the soul and senses. A delightful post — and what pictures. Can’t wait to see your garden at its summer height. And really interesting, and so very informative. This just in from a friend: We usually use an Echinacea/goldenseal compound at the first sign of a cold and can ward it off completely or at least from becoming full blown. We’ve never had to use antibiotics or gotten flu shots, and so far so good!!! Vitamin C is also an important ingredient. I am wondering what part of the flower is used? How would one use it from their garden directly? Like Aloe it is so fun to feel such a direct connection to what nature provides. Thanks for the post and the history lesson.